These socks are for your large dolls such as Brighton Belle Pedigree 28" doll, 30" Reliable Vinyl walker doll, or 30" Mighty Star Vinyl walker doll. They will fit other large dolls as well as they are stretchy. 1. Lace edged to sock - can be turned down with frill below or have sock pulled up high with frill at top. 2. Plain white socks - can be turn down for a cuff or have it up high for long socks. These are brand new in original packaging. Please tell us what type of sock you require. These socks are so pretty. They are lace edged and can be turned down into a cuff with lace at the bottom or pulled up into a longer sock with lace at the top. 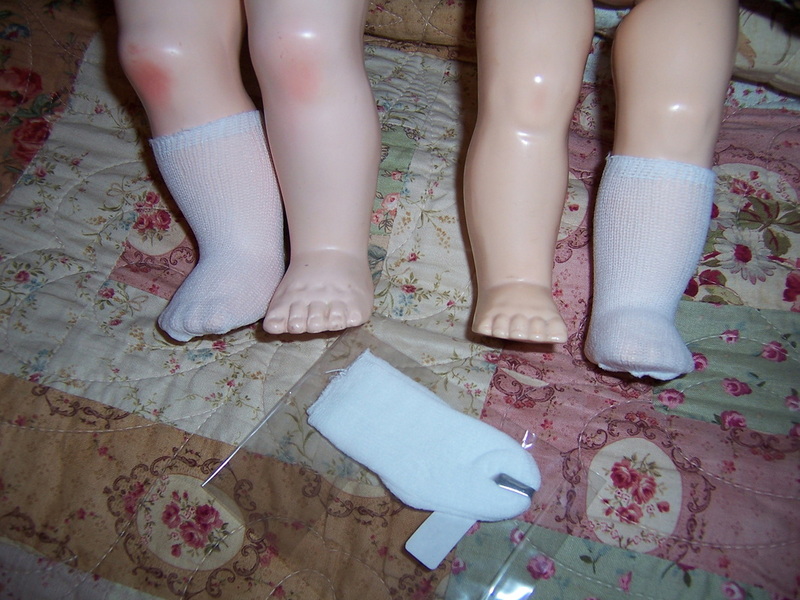 These socks fit 22" Pedigree dolls, 22" Saucy Walker Ideal dolls, 22" Posie Bent Knee Dolls, 22" Susan Stroller dolls, 20" Pedigree doll and many more type of dolls. I have restocked with only pink and white socks. ​They are also available in smaller size for 16'' Pedigree doll or dolls of similar size. These little socks are just plain white, and can be turned over with a cuff or pulled up for long socks. They will fit 16" Pedigree dolls, 14" Pedigree dolls, 16" Saucy Walker dolls and other dolls of similar height. They are brand new in original packaging.